It’s in the non-creature support cards that Kicker truly has a chance to shine, and at the front of the line is the versatile Burst Lightning. One of those cards that is strictly better than another card (in this case, Shock), this gives you the versatility to upgrade the damage dealt later in the game, and the deck wisely packs in two copies. The burn package is further enhanced by a pair of Spire Barrages and a Fireball. Spire Barrage is an interesting choice- it’s slow and expensive, a 5-cost Sorcery, but has potential for large amounts of damage. The problem with the choice, though, is that it’s optimised in a mono-Red deck, and somewhat limited in impact by having to share space with Islands. One must wonder whether this “throttling” effect in a two-colour deck was intended by the designers to give the deck a solid but not overbearing burn effect, or instead was just an attempt to show off a new spell. Either way, it’s a bit of a poor choice. While Act of Treason rounds out the set’s Red spells, Blue has a few tricks up its sleeve as well. Into the Roil is a very solid card, and should almost always be cast with the Kicker. Sleep is a bit like Blue’s version of Overrun– a card that with correct positioning can win the game for you. Lastly, one of the deck’s two Rares is here in the form of Rite of Replication. 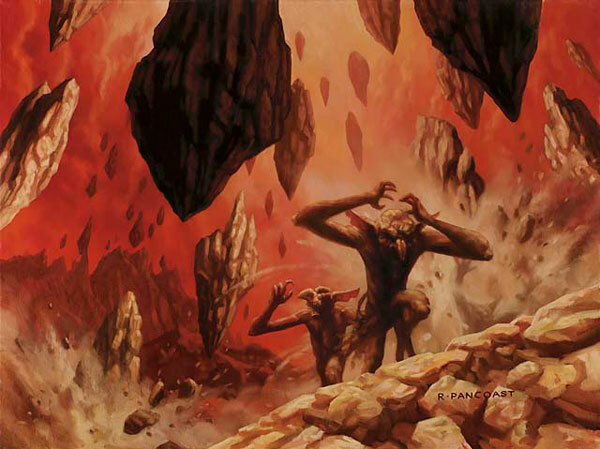 The Rite seems part of a cycle of Rare cards in the set that basically says, “if someone can’t kill you before you have nine mana available to you, you’ll swing the game.” Each of them- Conqueror’s Pledge, Elemental Appeal, Gigantiform, Rite of Replication and Sadistic Sacrament– have solid effects that can become back-breaking if the kicker can be afforded. And while having such a spell can be useful under the right conditions, it’s virtually wasted in Pumped Up. The deck does not have a single ramp card or effect that allows you to get to the nine mana you’d need to cast this kicked sooner than simply laying down nine land cards. In other words, if you’ve not managed to finish off your opponent by the time you can cast this with Kicker, you might well be doing something wrong (or just playing far too conservatively). 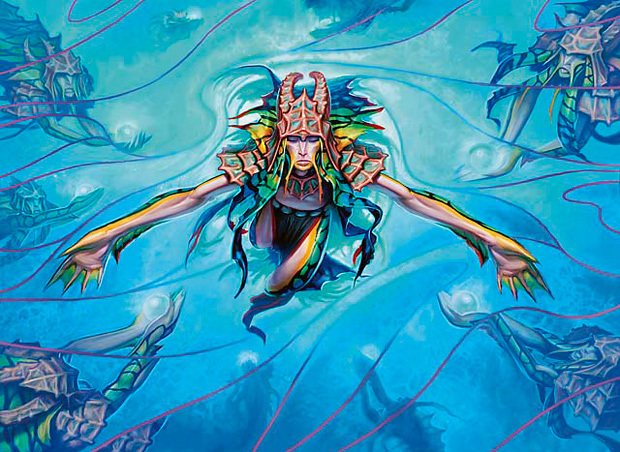 Next, let’s look at the deck’s creatures, which will be your primary win condition in the deck. Smooth draws should be the norm for the deck, with plenty of early game play options and lessened opportunity for mana screw to completely shut you down, since you’ll only need a few land to at least function at a basic level. The creature selection, though, does leave a little to be desired. For one, there are a fair number of underwhelming cards here. The sole one-drop, a Raging Goblin, is a nice enough turn 1 play, but gets drastically worse with each round that passes. For a deck that promises a “fast and furious assault,” it’s a head-scratching inclusion as a singleton. The Goblin Piker and Canyon Minotaur are also very bland, mediocre cards. The good news is, from there it does start to improve. There’s a pair of unblockables (Phantom Warrior and the kickable Aether Figment), a decent presence in the air (two solid 2-power Welkin Terns and a Dragon Whelp), some potential two-for-ones in the pair of Torch Slingers, a Prodigal Pyromancer to snip your opponent’s low-hanging fruit, and lastly a pair of Molten Ravagers. From experience, I like the Ravager: it’s a 4-toughness body that can be a soild and dependable blocker, but also a good way to convert mana to damage. The last card of the deck, the foil premium rare Hellkite Charger is a superb top-of-the-curve beater with an ability that can quickly end games. Overall, though, the card choice for Pumped Up doesn’t seem especially exciting. While Kicker is a very useful mechanic, will it be enough to sustain what already seems like a fairly mediocre deck? Join us next time when we sleeve it up and put it through its paces! So far, not very impressed with Pumped Up (and what an awful name!). Not enough quality creatures to win via aggression, not a strong enough late game (with the exception of the dragon) to win via control. As such, it’s a tempo deck without enough good tempo-producing cards (Aether Adept would be nice here, were it available at the time). I’d be surprised if this deck can win the majority of its games; I suspect most of its wins will be from a timely hastey flyer. 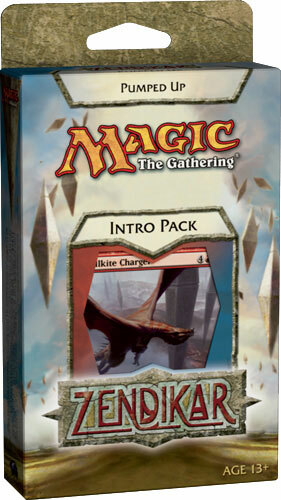 I’ve always loved your analysis of the sealed product that WotC gives us. I, too, am quite critical– but immensely appreciative!– of these decks they give us. Rite of Replication has got to be my favorite card from Zendikar. I haven’t played with this intro pack, so I hope that the Rite came up for you during the games and served well! RoR re-pre-zentin’! Have you tried the Rite of Replication with the Halimar Excavator? If you can get RoR off with Kicker, you win (target player mills 180 cards from their library). It plays of the same “enters the battlefield together” rules mechanic that powers the Valakut/Scapeshift deck. That actually is my current deck, yes. 🙂 With Halimar Depths, Sphinx of Lost Truths, and Sea Gate Oracle digging for the combo. I feel like these evaluations really ought to include the decklist (or a link to it).